Biscotti Thins — Thin, But Not Too Rich! Biscotti Thins are one of my favorite cookies, and this my all-time favorite recipe. However, I can’t say I’ve ever made them the same way twice! I usually mix and match the fruit, or sometimes I just get trail mix or various dried fruit and nut blends from the bulk section of HEB or Whole Foods. These biscotti thins can be made with almost any kind of chopped dried fruit, nut, candy and flavorings. This version is pretty basic and calls for pecans, white chips and dried cranberries – three things I had in the pantry. I also used a full-size loaf pan, but sometimes I halve or even quarter the recipe and bake in small loaf pans or cupcake cups. The only downside to homemade biscotti thins is that they are addictive. Seriously, they are hard to stop eating. I usually eat a few and hide the rest in the freezer, where of course they’ll stay fresh for months. Biscotti thins will stay fresh at room temperature for about a week, after which they’ll still taste good but not quite as great. 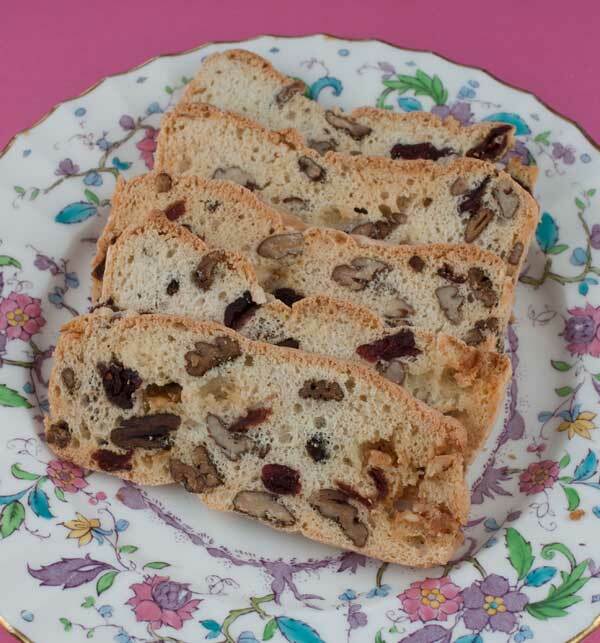 Very thin slices of biscotti with nuts, cranberries and white chips. Change the flavors by using different nuts, fruit and chips. Preheat oven to 350 degrees F. Line a 9x5 inch loaf pan with strips of parchment paper. In a metal or glass bowl, beat whites with a little of the salt until soft peaks form. Gradually beat in remaining salt and sugar; beat until stiff peaks form. Beat in vanilla. Sprinkle flour over meringue mixture, and with a heavy duty silicone scraper, fold it in. Mix together the pecans, chips and cranberries and fold them in carefully. Spoon the batter into your prepared loaf pan, spreading evenly. Bake on center rack for 35 minutes or until golden – it will still be a little soft. Cool loaf in pan for about 20 minutes, then remove from pan and let it cool to room temperature. When it’s almost cool, transfer to the refrigerator and chill until very cold – this makes it easier to slice. Preheat oven again to 250 degrees F.
Peel parchment off the cold loaf. With a serrated knife cut loaf crosswise into thin slices – mine are usually between 1/8 and 1/4 inch thick. Arrange slices on 2 baking sheets and bake for about 45 minutes (check at 30 minutes), switching racks halfway through. The goal is to dry them out without letting them get too brown, so keep a close eye on them. Remove from the oven and let cool. If they’re not completely crisp while hot, they should crisp as they cool. If you are making variations that have salted nuts, you may want to omit the salt or use the lesser amount. If you like these with a slightly salty (but not overly) kick, you could go as high as 1/4. Shirley, I’m going to hold you to that. Sue, they are good for both. Jan, I use a serrated knife. I’ve found some biscotti recipes work better with a regular knife while some are easier to cut with serrated. These definitely fall into the serrated category. Carolyn, thanks so much for taking the time to make them and post a comment! I really appreciate it. Sorry I didn’t reply sooner, but I was on vacation. Wow – these are so good! Completely addictive! These are right up there with the cookie bark/brittle recipe from a couple of years ago. Thank you! I just finished eating my last pack of thin addictives, they’re pretty good. My concern is the slicing of these, do you use a serrated knife, maybe electric? I have one impaired hand and it is difficult to slice, especially so narrow. I’d love to try these though! These would be fun to have as part of a dessert or snack table. Sound great, Anna. Maybe ? I’ll really make these later this week or coming weekend. Alex has been asking for biscotti! The same way, but line some cupcake cups with paper liners, divide the batter between the cups, and decrease the baking time to about 20 minutes. Once you’ve baked the little cupcakes, you chill the “cakes”, turn them on their sides, slice into thin rounds, and dry out in a 250 oven. how would you make them in cupcake cups? Jessica, I’ve seen those but have never tried them. The packaged version I used to buy was called Almondina and could only be found in gourmet stores or delis. How funny! These look just like the cranberry almond thins I bought at Costco yesterday…and the brand is called Thinaddictives. Sounds like an appropriate name, but something tells me that your version would taste even better.